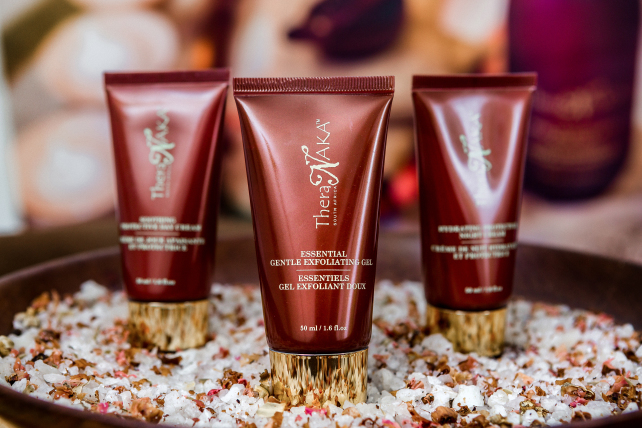 From heavenly aromas to herbal purity this unique body range is a mesmerising and innovative body and sense-soothing safari, replicating the earthy scents and the awe-inspiring wonder of this most profound continent. It is from these African gems that TheraNaka™ draws its raw materials to create a range exploding with earthy richness and new life. Amongst these precious ingredients is the oil from the Marula fruit, offering healing and moisturising properties; Mongongo nut oil, offering protection; healing Shea butter; oil from the Baobab tree, offering moisturising and anti-ageing properties; natural anti-inflammatory and anti-bacterial healing ointment from the African sausage tree; the immune boosting Redbush (Rooibos) offering anti-inflammatory and soothing properties; the flower of regeneration, the Cape Aloe (Aloe Ferox); the re-hydrating Kalahari melon; and the nourishing, restructuring, soothing and natural anti-inflammatory Mafura butter. We ensure that our products do not contain harmful alcohols, artificial fragrances, colorants, harmful petrochemicals or mineral oils, and they have not been tested on animals. Developed to take you on a journey that will open your eyes to the beauty and wonder that is Africa, TheraNaka™ will also show you the need of preserving and caring for this mother continent.